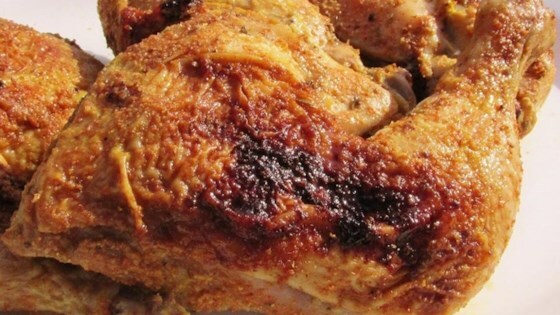 "A simple yet flavourful chicken, with spice rub and a maple-mustard glaze. This pairs perfectly with herb roasted potatoes and corn." Trim any overhanging skin from the chicken pieces. Whisk brown sugar, sea salt, 1 1/2 teaspoons garlic powder, 1 1/2 teaspoons onion powder, 1 1/2 teaspoons paprika, oregano, dry mustard, celery seed, and cayenne pepper together in a bowl. Rub spice mixture over all chicken pieces and under the skin of breast pieces; cover with plastic wrap and refrigerate for about 1 hour. Whisk maple syrup, yellow mustard, brown mustard, 1/2 teaspoon garlic powder, 1/2 teaspoon onion powder, 1/2 teaspoon paprika, and black pepper together in a bowl. Place chicken pieces skin-side up on prepared pan; place breast pieces in center of pan, and place leg quarters near the edges. Roast in the preheated oven 15 minutes; baste chicken with maple glaze. Rotate pan; roast 15 minutes, and baste again with maple glaze. Continue roasting until chicken is no longer pink at the bone and juices run clear, basting again if needed, about 10 minutes. An instant-read thermometer inserted near the bone should read 165 degrees F (74 degrees C). I often brine the chicken for a few hours to keep it moist. Just make sure to rinse and pat dry the chicken before adding the rub. Nutrition data for this recipe includes the full amount of spice rub and maple glaze. The actual amount of spice rub and maple glaze consumed will vary. I cannot have sugar at this time in my life so I simply deleted it. I added three other spices that I can have: turmeric, fennel seed, and celery seed. The best flavored chicken quarters ever. So sticky, moist, and yummy. Definitely one of my favorites. I took the advice of another cook and brined it for about an hour before. The chicken was very moist and flavorful. Made this after a friend served it to us. I used 3 1/2pounds of split bone in chicken breasts and I doubled the glaze amount. Loved this recipe. Great combination of sweet and spicy. We loved this. Yes, make more glaze. I added some additional spices to the mix and had to turn on the convection roast feature to get the skin crispy. But, the chicken came out great.